You know when you get to a recipe and the blogger writes a NOVEL before getting you to the meat of why you were there in the first place? Yeah. A little personal story. OK. A long novel. No. I will not bore you with any of that today, these cinnamon rolls will wait for no one. They are way too amazing. In a bowl mix the two flours. In a food processor, pulse the flours with the sugar, baking soda, baking powder, and salt just until combined. Add the butter and pulse again until the mixture looks like cornmeal, and the butter has been processed into the size of very small peas. Mix the vanilla with the buttermilk, then add it all to the flour mixture and pulse until just combined. The dough will be sticky. Don't over mix. 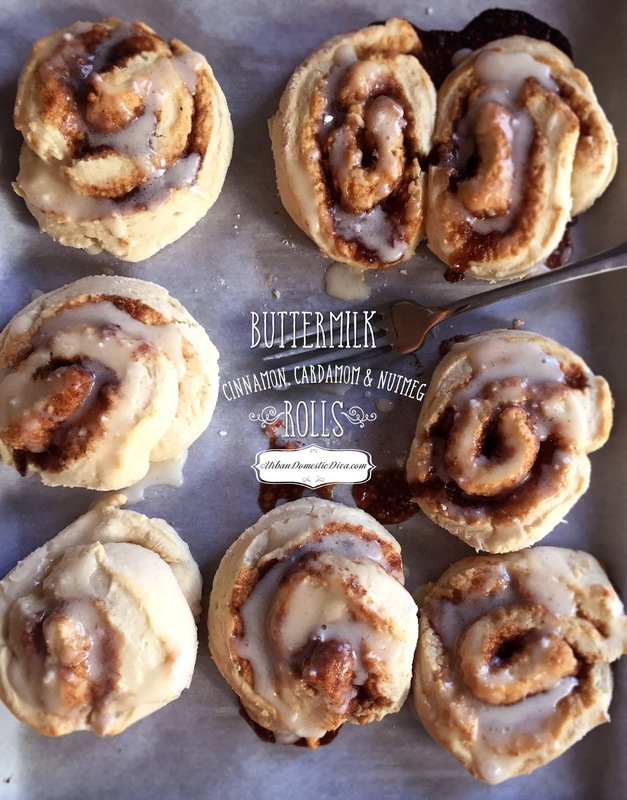 You want "nubs" of butter for flaky rolls. Let the dough sit and rest for a few minutes while you start the filling. In a small bowl, whisk the sugars with the cinnamon, cardamom, nutmeg, and salt. Set aside. On a generously floured surface, scrape the dough onto it. Flour your fingers, and flatten the dough into a rectangle. Fold one edge onto the center, then the other. Flatten to an inch thick. Fold one edge over to the center, then the other again, and flatten. Use the flour to make sure things don't stick. Finally, fold one edge to the center, then the other, for a total of three times. Now, flatten or roll the dough into an 18 x 10-inch rectangle, making sure the bottom is well floured so it is not sticking to the surface. Sometimes my "log" gets longer than that-whatever works. The longer the dough log, the more rolls you can make. Melt the butter with the honey on 30% power for about 40 seconds or so in the microwave. Using a pastry brush, liberally brush the butter mixture on the dough, leaving about 1/4 left for drizzling on top. Sprinkle the sugar and spice mixture evenly, then take the last of the butter mixture and drizzle on top of the spice layer. Preheat oven to 400˚. Using floured fingers, take one lengthwise side and tightly roll toward the middle meeting at the other end, turning into a log. Roll it back so the seam is on the bottom. Using a floured, serrated knife, cut the roll into 1-1 1/2" rolls. Tuck the seam under each roll and place on a parchment-lined baking sheet. Continue until all are cut (see note below for freezing). Bake for about 12-15 minutes, until puffy with golden edges. Let cool on the pan for about ten minutes before drizzling the icing. Serve warm. Store leftover in an airtight container for a few days. Melt the butter, then mix the powdered sugar, cream, and vanilla until smooth. After cutting the rolls, place in a freezer bag lined with parchment paper. Lie flat in the freezer. Defrost the rolls the night before and add a few more minutes to the baking time if the dough is still cold.